My very first holiday decoration, given to me by my friend, Sandra. I just love this little church!! Today was incredible. I took off on my usual walking routine, but I felt a nudge to walk in a different direction. I just did what I felt the Holy Spirit prompted and ended up walking around 5 churches and praying for them! It was so cool! Sometimes I sang worship songs as I circled; other times I prayed aloud or silently. Afterwards, heart full of joy, I walked down a busy street singing, “Joy to the World!” A couple nearby laughed at me, but I didn’t care. My song was for HIM not them. What an unexpected adventure. I took off walking to burn calories and ended up in a totally unplanned spiritual experience! About that whole tired of hiding thing I wrote about a while back. Christmas is an issue where I’ve hidden. Here’s the deal. I write for the Christian market who LOVES Christmas. My first traditional fiction release was a Christmas novella! But here’s the rub: I grew up in a church culture who believed in the incarnation of Jesus as the Son of God, but didn’t celebrate Christmas due to its connection with pagan origins. We left that church 19 years ago, but still have many family and friends who believe that way. As long as a person believes Jesus is Lord and seeks the direction of the Holy Spirit, I say stuff like that is up to personal conviction. But at some level I’m always hiding it seems, on this Christmas thing, even at home. My husband and I struggle with what we want Christmas to be for our family. For years we fought each December about what was appropriate. Over time we found uneasy compromises, me always afraid I was pushing past his comfort zone. Him always wanting to please and love me without compromising his convictions. So here I am world, not hiding. Christmas at our house is still sometimes confused. I’ve been reading a book about spiritual connectivity—ways we all connect to God, called Sacred Pathways. I believe part of Jerry and my struggle with the holiday has to do with our spiritual wiring. The other day I walked past a house that had a glass front door. Inside, stairs lead from the door to a second level. The railing on the staircase was wrapped in evergreen and little white lights twinkled. In the windows of the second floor, candles glowed. I had to stop walking—despite the fact my exercise app was still running. I just stood there, staring at the beauty. Immediately, my heart rose to God in joy and worship of Jesus and His coming to earth. 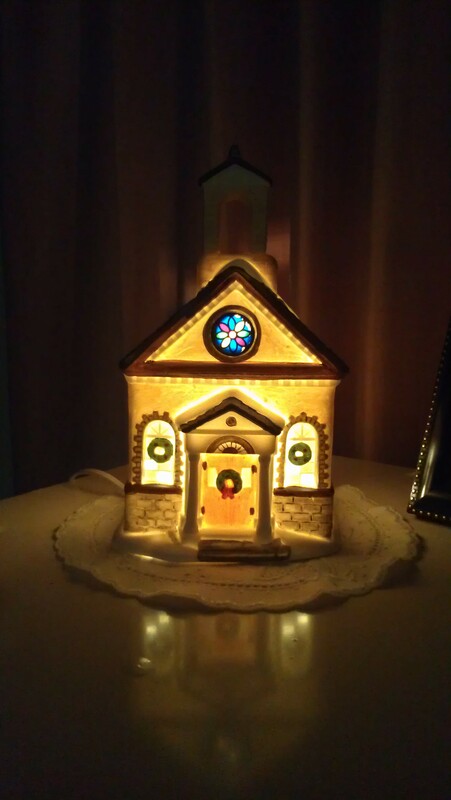 I doubt my hubby could relate to how my heart explodes in praise at the beauty of Christmas decorations. Maybe it’s a girl/guy thing. This surprise path on my walking was the beginning of some amazing December adventures. Jesus certainly surprised me as He took my exercise routine and gave it lots of unexpected twists and turns. You’ll get to hear about more of them over the next few weeks. Some of them blew my mind! And I love how I began the journey to lose weight on the outside, but how I’m having new experiences on the inside at the same time. Any surprises in your exercise journey? How about your inside journey? Okay, this may sound crazy, but I think the way you grew up not celebrating Christmas was a blessing in the long run. Now you are able to look upon Christmas and all it entails with child-like eyes, yet with a mature heart and soul. You’re seeing its beauty and allowing it to lead you to worship, while the rest of us sometimes allow it to become mundane, busy, etc and forget to stop and worship the true reason for the season!! What a kind thing to say, Caryl! And I think that is part of what Jerry wants to hold onto–not so much the wonder–but the ability to stay out of the busy, stress part of the holidays.